This post has been a long time in coming! My game dev and related work have been thriving. 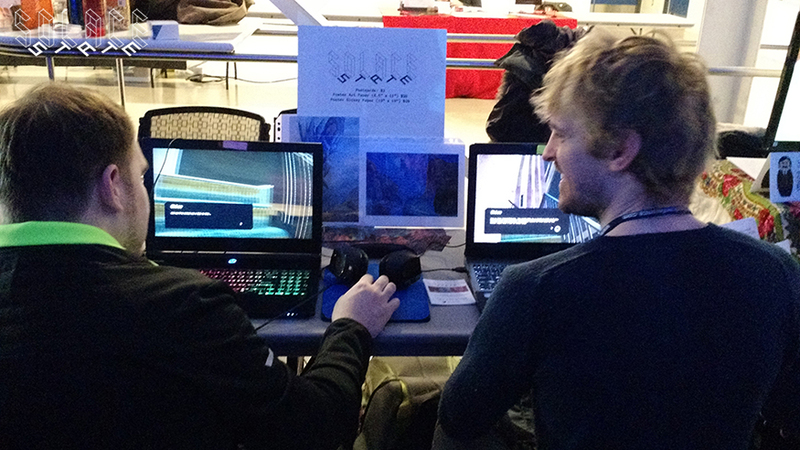 It’s been quite an adventure in December and January: I had a great time showcasing the first build at the Canadian Video Game Awards with Bit Bazaar, and I continued working on some build ideas for Solace State. I took some time off during the winter holidays to relax with family and friends, managed to catch a cold, started writing some short stories, and began a new teaching job at university in intro to 3D game arts. I also started networking a bit more to see if there are any local collaborators who can help me with character art, localization and programming. 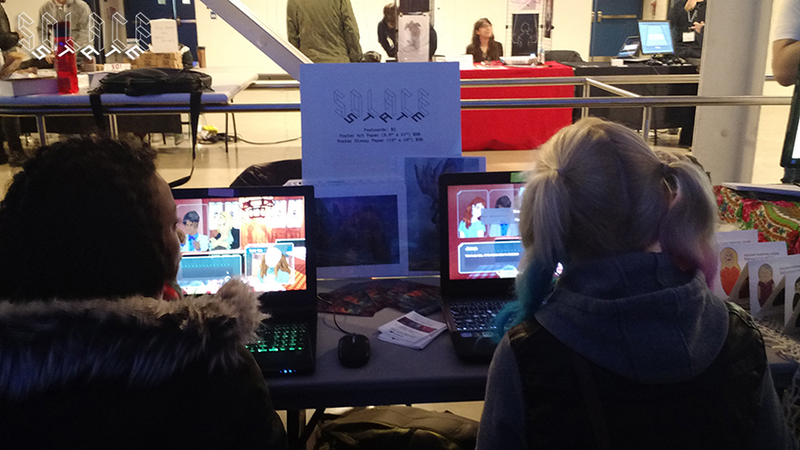 On Dec 5th and 6th, Solace State had its first outing with Bit Bazaar and the Canadian Video Game Awards Fanfest. 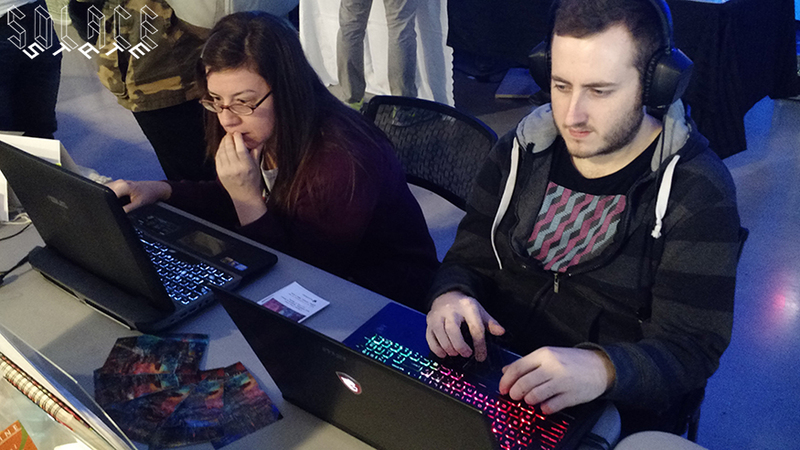 Surprisingly, the vast majority people played through a 20-30 minute gameplay demo, which was beyond my expectations. I had set up the demo so that people can skip between scenes and levels if they wish, and practically no one took me up on that offer (unless they were manning a booth and had to run back to their responsibilities). There were many experienced devs who shared their insight and feedback to me, and is it ever so valuable! 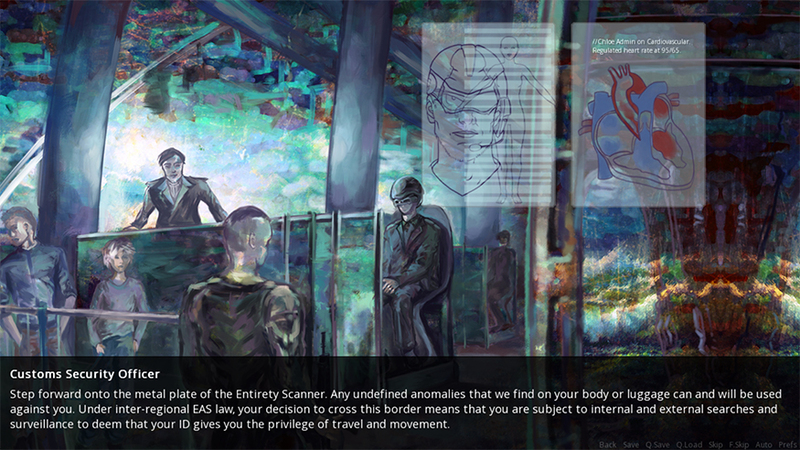 Many people enjoyed the main game mechanic, namely the “hacking-scrolling text environment”. 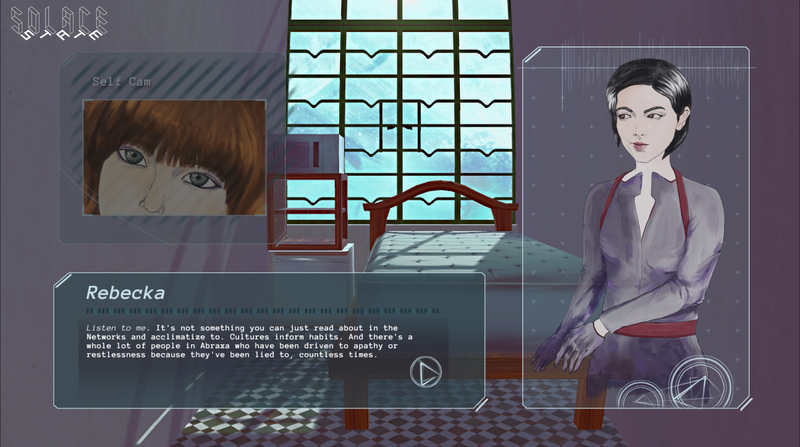 Most people seem to enjoy that part of the gameplay more than the straight-forward visual novel mode, and have asked if that part can be longer. They also “get” it right away as long as they know which keys to press (arrows or WASD), which means that it’s only been my communication about it on devlogs and social media without gameplay input that has been the real problem. Second, the constructive critique of primarily other gamedev community members have helped me re-scope. A lot of the times, what I see as less-than-ideal in the game are also highlighted by fellow devs. It seems that I’m not far off the mark with my own self-assessment. As much as I’ve been writing in some academic or professional capacity for about 9 years, writing for a visual novel game is a different beast from all the creative writing that I’ve hitherto completed. I tend to write much more like a novelist than a typical comic book, where a lot of the key identifiers of the protagonist is clear on the first page. Of course, there can be twists and back-stories down the road, but nonetheless, key motivations are already set up in the first ten, fifteen minutes. Solace State doesn’t quite have that. That’s not necessarily game-breaking, as narrative-driven games like Gone Home and arguably Dear Esther has created a much more gradual reveal of their characters’ vivid colours and internal contradictions. But I do need to balance between what I save for later, and what I reveal in the first ten minutes of the game. On the flip side of the coin, I also have to remind myself to keep conversations and scenes to be more organic, and less utilitarian to the greater arc of the plot. Without a doubt, there should never be “filler material”. But, I also strive to describe those moments and beats that reveal something intrinsic about the characters and how they feel to each other, what they mean to each other. It’s these little moments where relationships can be built, and can fall apart. What’s interesting, of course, is that games are becoming more of something that doesn’t get consumed in one sitting, whereas plays and films are. The middle ground to all of this is to emulate some inspirations from television drama, which takes a more episodic approach to its narrative arc. At least, this is the way that I have framed it, and it has helped me acknowledge which scenes may have too much detail, and others not enough screen time to develop the right emotional beats. Again, it’s worlds different from writing an article or novella; My usual playgrounds, where a single line can leave one breathless with its impact. There’s a few people who have pointed out the incongruity of the semi-cartoony character art with the rest of the universe, including the 3D environment and the tone of the writing. I happen to agree with them. People seem to love wandering through the 3D environment as a purely artistic experience though, so I’m not going to change anything there. Just going to add more content! With some feedback, I’ve decided to do a prototype of hack scenes that are more primary, cutting out the traditional dialogue format and UI typical to visual novels. There should be textual puzzles that must be solved within its bounds, as well as clickable objects to reveal more narration and dialogue. This is to ensure that the requisite narrative dialogue is met. Each scene should have an intertitle explaining Chloe’s goals, in her own words, so that the player knows what to expect in terms of narrative goals and broader trajectory. In practical terms of the intertitles, the textual puzzles, and the clickable objects, it means that I should maintain a key plotline by consistently (re)defining where Chloe might find Rebecka with new sources of information. When we start off, we discover gradually who Rebecka’s last contacts are. Key stuff on the to-do list: Upgrade from 5.2.4 to 5.3.x; Create Save and Load variables; Create a history log for dialogue; Create a variable mini-encyclopedia for all characters and places as they populate in the narrative; Improve on the pause screen. Solace State is in its early production stage. It is an interactive novel where you play as Chloe, a young hacker who must navigate a near-future metropolis to re-unite with her friends, and contend with both the tyranny of the great and the sectarianism of the many. For more information, please see the recent re-introduction post here! What does it look like? The new screen captures from today show the game mechanics and art style which will stay consistent for most of the rest of the project. In Solace State, you play from Chloe’s perspective. The core mechanic, as described in a previous post, remains simple and unchanged: You get to chose some of her dialogue and actions through contextual buttons, to try to develop and maintain trust or exploit a character or social group. This plays out in a branching narrative, similar to many story-driven games and interactive fiction. 95% of what will appear on the screen are events through her eyes. This includes the room that you’re in, to the computer hologram pop-ups that greet you. This was a design decision that took a while to articulate, since I do want the protagonist’s face to show up now and then, but I also want to maintain immersion of a singular perspective. This is a first design for the UI, where one character talks to you. The character will have expressions to match what they are saying, but will generally be static, similar in style with many Visual Novels. The self-cam shows Chloe’s face or nearby proximity as appropriate for the scene, and sometimes no image feed at all. Since this scene is early in the game, I chose to crop in on her eyes and reveal her full appearance over time. This UI design is still preliminary, and there will be other configurations in other scenes so that the holo-screens do not block a particular focal point in the background. The background is fully 3D in Unity 5, and takes advantage of its physical shaders, and therefore can include atmospheric effects such as shifting light rays, reflective moving surfaces, and much more. The second major game mechanic that I’ve been testing lately is the ability to find key information and extrapolate emotional narration from our main character without the use of flashbacks. This one is structured around Chloe’s playground – her hackspace – and lets the player scroll through an isometric space to find and read information. Another design consideration is that I have to consider how to write for something that will likely be read out of order – an interesting premise! 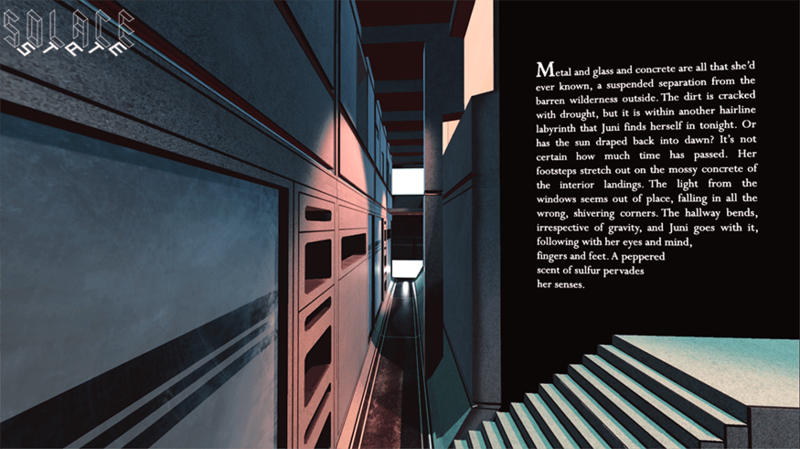 The player also pieces together the architectural space gradually, which can give more flavour or clues as to what the narrative slices are about. *Note: The grainy, blurry quality of the GIF above is because it was very compressed for web! Rest assured that the textures look better in Unity realtime, or as a Video file. I’m quite excited about both of these gameplay trajectories as Solace State starts feeling much more interactive! Thanks for reading! 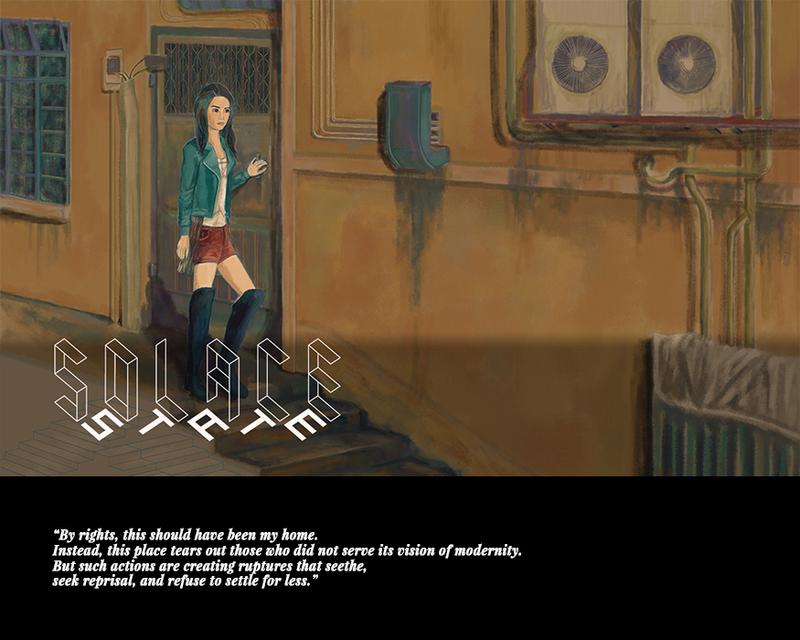 A lot has changed over the past months for how Solace State looked, told its story, and played out. I had expected development to be a thoroughly transformative process, and it has not disappointed me. I read up on a number of studies that examined political resistance, as well as cyberspace as the new frontier for civil struggles, and it led to a number of broad changes both to narrative and to gameplay itself. “Our future, our design!” In 2038, Abraxa Harbour city-state is hailed by its wealthy as the crowning jewel of thriving markets and cosmopolitan culture, at odds with the increasing number of destitute who live in the shadows of its skyscrapers. But this is the year that even students and workers see their future dwindling away, and they rally to form a society different from what the city’s strongholds have authorized. A young woman, Chloe, is in many ways an outsider, a newcomer who finds Abraxa full of forbidden and cryptic histories. But she must strike deep into the storied urban streets in order to reunite with her friends, who have embedded and braced themselves to defend their livelihoods. Can she reunite them across ideological divisions, or are some of them better off alone with their ambitions? With her machine-aided perception to see into reclusive worlds and associations, how will Chloe negotiate her hopes and fears in the midst of turbulent revolution? Solace State is an imaginary vision of participatory citizenship and negotiation between some very differing groups of people. It makes sense that players can engage with the narrative through various menus of choices that are reflexive of their own values. The sci-fi elements of the story allow the protagonist to quickly wrest information from the world and make strategic decisions. But most simply, this is a game with a story about people who often feel like outsiders, who are overlooked, but can come together to create new emergent livelihoods. Because I want to portray both utopic and dystopic elements, I feel like a game form can give me the greatest range of affective outcomes and not just show one tone or atmosphere, given that you can chose a path in the story. 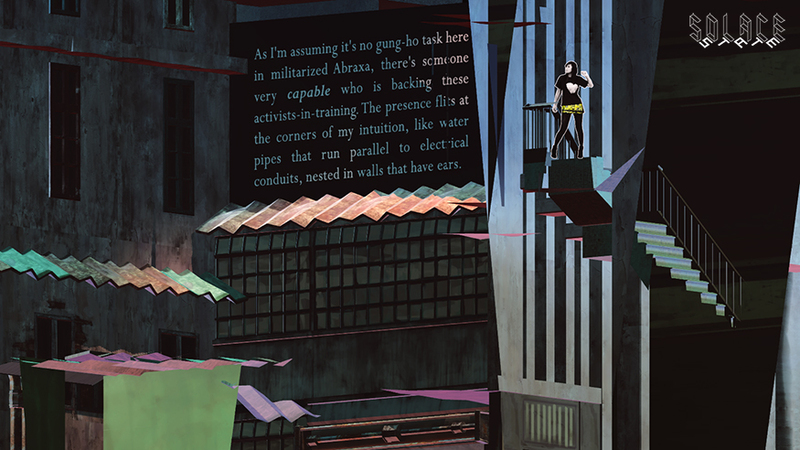 Above all, the players can interpret whether the story is utopic or dystopic themselves. Built in Unity 5, so that I can take advantage of the asset store for visual novel tools, as well as full 3D engine and realtime lighting capabilities. I started ruminating on the idea of a game about a futuristic student-led society since early 2013, when I had just completed a game arts & VFX internship in Hong Kong. I was traveling in East Asia and was having conversations with friends and artists there about our histories and civil identities. In Nov-Dec 2013, a group of friends and I put together a 5-minute playable level in Unity as a proof-of-concept. Back then, the game was called Babel. 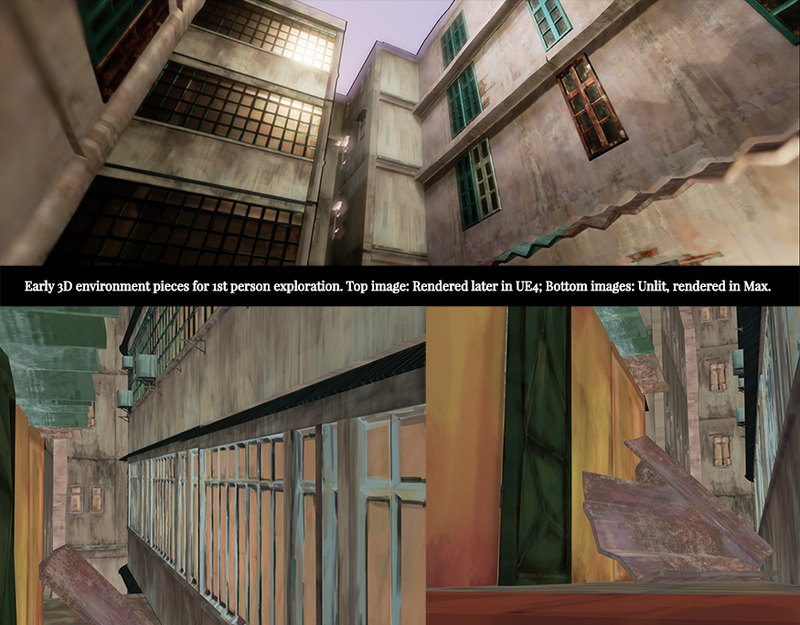 It featured point-and-click puzzles and voice-over narration in a 3D environment built for first-person exploration. Something didn’t quite grasp the agency and atmosphere that I wanted to convey in the first playable demo. The puzzles weren’t very good, and each of us in the team were considering longer-term job opportunities at the time. We put the project on indeterminable hold. In Fall 2014, outside of a couple of short-term freelance engagements, I returned to developing this game. After some consultation with programming and design friends, I realized that I really needed to hone in the script first for it to be a narrative-driven game, and that my gameplay will be informed by the key characteristics of the narrative. This may seem counter-intuitive for a lot of general how-to-dev guides that demand focus on gameplay first, but for me, interaction cannot be divorced from narrative action in a text-heavy game. Finally, it did not seem like I was fighting with gameplay ideas that could barely move past the prototype stage because the narrative seemed like flavor, not a key feature, and that was not necessarily something I wanted to produce for this particular game. Thus, through the remaining months of 2014 and early 2015, I drafted a cyberpunk story with an outline for the general arches of narrative action. I had a much better grasp of what I was going for, and Solace State as a name reflects both sci-fi and political overtures. I created a trailer in Feb 2015 to solidify the atmosphere and tone. I knew clearly what I want to highlight for Solace State: Conversations and building relationships and trust between characters. Which brings us to now: As a solo developer, I currently balance my time between design, game engine work, writing, and artwork. In Dec 2013, the game was a 3D exploration puzzler, and the models were realistically proportioned but had a very painterly texture to them. 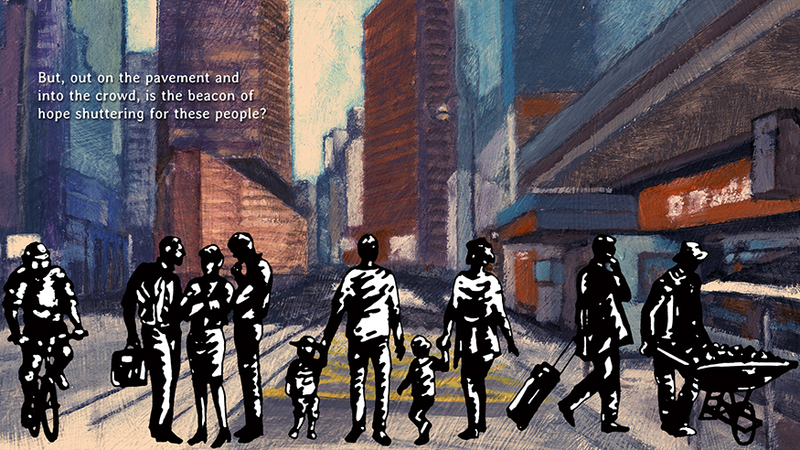 By Feb 2015, I have found a simpler style: Banksy-like graphical style with painterly 2D backgrounds. Now, I’m finding an in-between: 2D illustrated characters that will have more diverse facial expressions and a hand-drawn look. I am experimenting with 2.5D backgrounds and 3D scenes. Shown above: A Ren’Py prototype from Aug 2015. The art got a bit too convoluted, and I want a separation between characters and backdrop (kind of like Disney’s different styles between character and background art). This is a realtime prototype in Unity, created Sept 13, 2015. I want to see how I can push this with 2D flatty character art.